We know the British Saxon Osulf and Charlemagne’s son Charles were close, but just how close remains a mystery. The intrigue centers on a poem by the courtier Theodulf. The Visigoth composed a parody of Virgil’s Second Eclogue, about the shepherd Corydon and his love for the boy Alexis. In Theodulf’s version, the prince, Charles the Younger, is playing a flute for Mochanaz, whose name is similar to Arabic muhannat, meaning catamite. Mochanaz might be Osulf. Theodulf’s poem praises Charles the Younger (called Karl in my books), but his father, grandfather, and great-grandfather are urged to scourge Mochanaz. 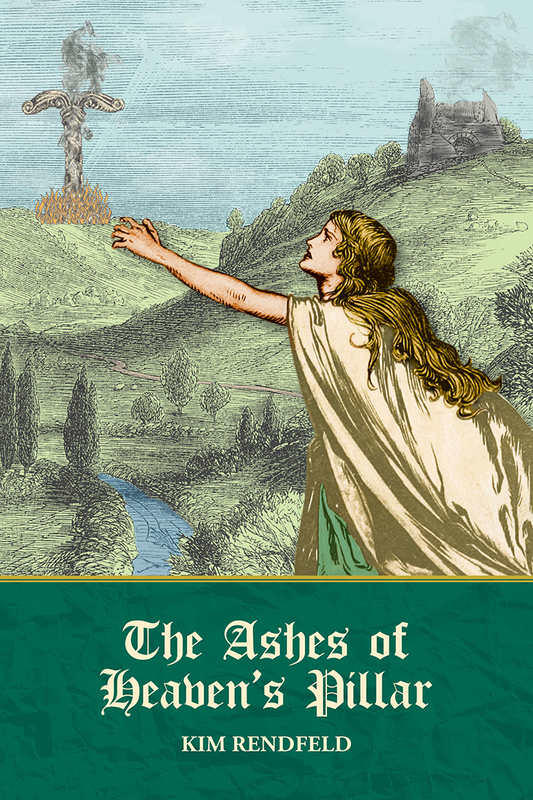 Originally published June 27, 2018, on English Historical Fiction Authors. 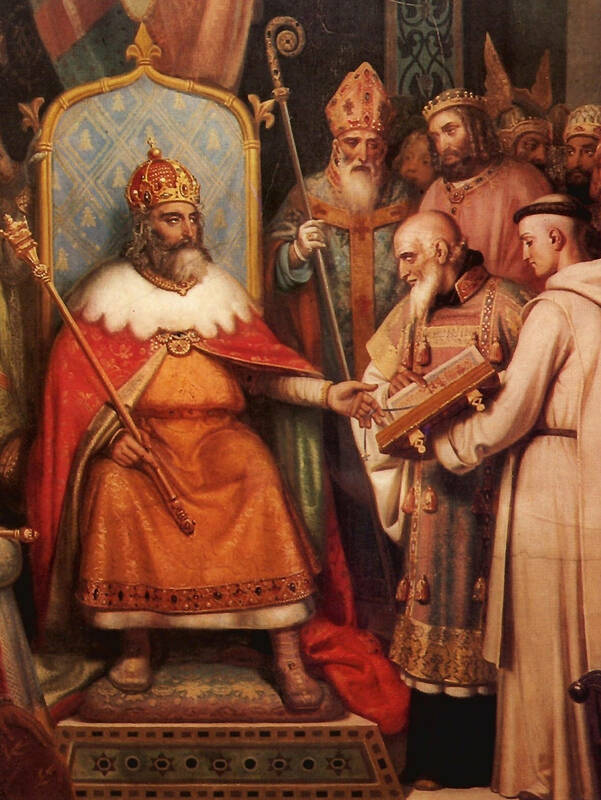 When his third wife died in 783, Charlemagne might not have wanted to marry again. Yet a few months later, he wed Fastrada, the heroine of my latest book, Queen of the Darkest Hour. So why would a king not want another spouse, then change his mind? A possible answer is politics. Charles likely grieved for Hildegard, but his love for her did not play a role in his decision. Marriage in early medieval times was a matter of the head, not the heart. In Rome two years earlier, two of Hildegard’s sons were named to subkings of their father’s empire. Her middle son, 4-year-old Carloman, was baptized and renamed Pepin, even though Charles had a child by that name. The younger Pepin (whom I call Carloman in my first two novels and Little Pippin in Queen of the Darkest Hour) and her youngest son, 3-year-old Louis, were named subkings of Aquitaine and Italy. Her daughter Hruodtrude was betrothed to another child, the Byzantine emperor (his mom was regent). Like most medieval noblewomen, Hildegard was ambitious for her children. With the elder Pepin, the son of Charles’s first ex-wife (later declared a concubine), likely destined to enter the Church as an archbishop, Hildegard probably expected her eldest son, Karl (called Charles the Younger by scholars) to inherit the rest. Frankish tradition was for each son born in wedlock to inherit a kingdom, rather than primogeniture (only the eldest legitimate son gets the throne). Charles had not yet designated the rest of the realm—dividing the kingdom prematurely could lead to literal battles if the monarch fathered another son—but Charles might have favored Hildegard’s plan. This way of distributing the lands would have given each of Hildegard’s sons a sizeable inheritance and maintained the alliance with her powerful family. Charles could only hope that his sons would avoid the conflict that had threatened the peace between him and his late brother, Carloman. To marry again after Hildegard’s death would be a gamble. If Charles had a son by another wife, this additional claimant to the throne would lessen Karl’s lands, and it could complicate matters with Hildegard’s powerful kin. A few months after losing Hildegard, Charles went to war in Saxony (again). Although victorious, he must have realized he needed to bolster his alliances in the eastern part of the realm. He married Fastrada, an East Frank, that October and took the risk. Already a father of seven (and probably an eighth on the way by a concubine), he might have been happy if all Fastrada did was oversee his treasury, control access to him, and tend to the household. She did not need to conceive to secure her position, but conceive she did. And I can’t help but wonder: Did Charles pray for a girl? This post was originally published on Susan Keogh’s blog on Sept. 5, 2018. In 781, Alcuin had a choice. Should he accept an offer from Frankish King Charles (Charlemagne) to teach in the brand new Palace School or should he continue serving as master of the Cathedral School of York as he had for 15 years? At the time, the Northumbrian was about 46. (His exact birthdate is unknown; the estimate is 735, which is good enough for me.) He had been with the York school since he was a child, placed there by his noble parents. York was a prestigious place, second only to Canterbury. York’s archbishop, Ecgberht, was King Eadberht’s brother. Alcuin proved to be an apt pupil and said the school taught him “with tenderness of a mother’s love” and “a fatherly chastisement.” He attracted the attention of Ælbert, the master of the school, and Ecgberht. In the morning, Ecgberht taught Latin literature, Greek, Roman law, astronomy, music, and theology such as the New Testament. Ælbert’s subjects were rhetoric, grammar, jurisprudence, poetry, astronomy, and the Old Testament. The students attended Mass at midday, followed by dinner and recreation, which included discussions and debates of the morning’s lesson. At vespers, students knelt for blessing. Alcuin also might have grown up hearing about missionaries such as Willibrord and Wigbert, who tried to convert pagan peoples on the Continent. 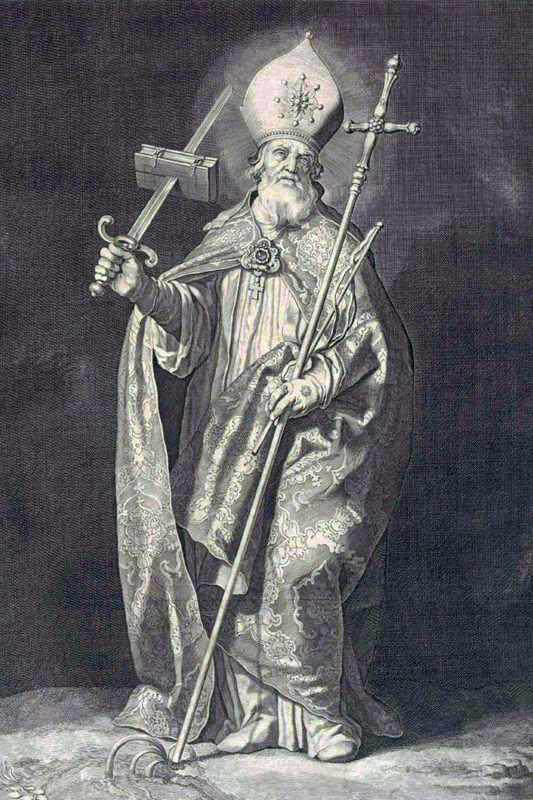 He likely knew about Boniface and the nuns and priests who followed him across the channel to strengthen Christianity. Alcuin would have been 19 when Boniface was martyred. When Alcuin was 20, Ecgberht sent him to the Continent to acquire books to enrich York’s library, an expensive and hazardous mission. Alcuin risked his ship sinking, bandits on the road, being robbed by hosts, and sudden turns in the weather. Books were precious. Made of sheepskin, a large tome could require a whole herd. They were copied by hand, and those beautiful illuminations and ornate covers added to the price. Yet York had a collection to boast about. It included work by Greeks and Romans (Aristotle, Virgil, Cicero, and Lucan), Church fathers (Jerome, Ambrose, Hilary, Augustine, Leo, and Gregory the Great), historians (Bede and Aldhelm), and grammarians (Donatus, Probus, and Phocas). We don’t know how long Alcuin’s first errand for the archbishop lasted, but it likely took months. At home, the political situation was unstable. Alcuin thought King Eadberht, the archbishop’s brother, had a prosperous, harmonious, and militarily successful reign. But in 756, when Alcuin was 21, Eadberht suffered a disastrous defeat. Two years later, the king received the tonsure and joined his brother at York. The king’s successor, his son Oswulf, was murdered a year later. In 766—and two more Northumbrian kings later—Ecgberht died. Ælbert succeeded the archbishop, and Alcuin, newly ordained a deacon, became master of York’s school. Alcuin must have been a good teacher. He attracted students from all over Britain and abroad, including Frisia and Ireland. Politics remained volatile. In 774, another king seized the crown after his predecessor was deposed and exiled. Four years later, Ælbert resigned his archbishopric to retire, and Alcuin’s friend Eanbald succeeded him. Ælbert died in 780. Soon after, Eanbald sent Alcuin to Rome to fetch a pallium (a woolen band with pendants that symbolize authority). Alcuin was on his way home when he met the king of the Franks. What was running through Alcuin’s mind when Charles asked him to come to the Frankish court? Here is my speculation. He might have craved stability on the political front. In the past 10 years, Northumbria had three kings, and the current one was leading his realm into immorality. Charles had ruled the Franks alone since 771. Twice divorced, the king of the Franks had his own shortcomings, but he was a steadfast husband to his current wife. More important, he was an ally of the pope and providing missionaries like Alcuin’s friend Willehad with the military support for they needed to bring Christianity to pagans. In the Frankish court, Alcuin could interact with scholars from Italy, Francia, Ireland, and Hispania. He would still teach. His students would be the royal family and their close friends. The prospect of leaving York might have been nerve-wracking, yet the opportunity to do something different might have excited him. Alcuin returned to York to get his superior’s permission to join the Palace School in Francia. With that choice, he would help build the intellectual foundation for Charles’ empire. “Alcuin” by James Burns, The Catholic Encyclopedia. Vol. 1. New York: Robert Appleton Company, 1907. 16 Jun. 2018 . In 757, if we are to believe the Royal Frankish Annals, Tassilo, the teenage duke of Bavaria, visited Frankish King Pepin and swore his fealty to the monarch and his sons on the relics of five saints. He touched the bodies of Dionysius, Rusticus, Eleutherius, Germanus, and Martin. 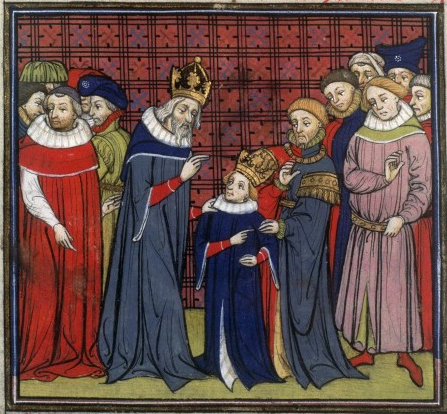 Scholars have said the Frankish annalist might have exaggerated the nature of the visit, as medieval writers were wont to do to please their bosses, in this case Pepin’s son Charles (Charlemagne). In reality, the visit might have been one of friendship rather than submission. Besides, that’s an awful lot of saints to bring to this occasion, considering the need for security and holy men. But for storyteller purposes, to have Tassilo swear on all those saints would have made his alleged disloyalty decades later all the more horrendous and justify Charles deposing his cousin. Imagining massive processions and huge reliquaries carried by carts or multiple men, I was inclined to believe that part about the saints not really being present at the meeting. Then I encountered portable reliquaries in my research for Queen of the Darkest Hour. Perhaps, it was possible to bring a token from all those saints—not whole skeletons but tiny items connected to the divine and imbued with miraculous power. Portable reliquaries were common throughout the West in the early Middle Ages, when travel was expensive and dangerous. Although every Christian aspired to go to Rome at least once, many could not afford the trip. The pilgrims who made the journey likely wanted to make the most of it, and a portable reliquary allowed them to do so. About five inches tall, the reliquaries were easy for one person to carry. With them, a pilgrim could bring a physical part of their faith home and interact with it. They would remain in the presence of the saint throughout their life, and they could bequeath this precious gift to their children. This might be a good time to define just what a relic is. It was a physical thing connected to Jesus or one of the saints. It could be a pebble from a holy tomb, some dust from the tomb’s base, a vial of oil from a lamp burned over the tomb, a bone chip, a hair, a splinter of the true cross, a shred of clothing, or twigs from trees where the shepherds watched their flocks by night. It need not be large. And it could look quite ordinary. The pilgrim had no objective way of knowing if the twigs were really from a saint’s favorite tree or a nearby woodpile, and some sellers of relics were less than scrupulous. The pilgrim was better off collecting a relic on site rather than buying one. Whatever the form, the objects made events in Christian history real. To transport the relics, medieval pilgrims could carry a block of wood carved into the shape of a purse and hollowed out. As they traveled, they could collect relics of the saints they visited. The relic was wrapped in a bit of linen or silk, perhaps cut from discarded church hanging or liturgical vestments. Sometimes the cloth was stitched to secure the relics and labeled with a scrap of papyrus. Once filled, the purse was sealed with a plug or sliding panel. To make this carved wood fitting for saintly objects, the purse was covered with a gilded metal, then stamped or decorated with gemstones or ivory. After chains were attached, the portable reliquary could be hung from a church beam or in a chapel, put on a bedpost, worn around the neck, or carried in a procession. If the reliquary belonged to a church, a holy man could use it to raise revenue, heal the sick with its miraculous powers, bring warring factions to the peace table, or seek intercession during a famine or other natural disaster. In a palace, the reliquary gave the king an aura of holiness, and it was handy when it came time for a vassal to swear an oath. It was one thing to offend a human lord, but quite another to anger a saint. Whether Tassilo made a vow (assuming he did) while touching the actual saints’ bones or a portable reliquary with tiny objects, the promise was just as sacred. Photos by Kleon3, CC BY-SA 3.0, via Wikimedia Commons. Originally published Aug. 28, 2018, on English Historical Fiction Authors. Although seldom mentioned in annals, queens in Carolingian era (eighth and ninth century Francia) had a much more important role than a casual 21st century observer might think. If the king did not already have heirs, the queen’s primary role was to produce healthy sons to inherit the realm, and some kings tried to divorce wives unable to bear children. My main characters’ inability to conceive becomes a point of contention in my first novel, The Cross and the Dragon. Paradoxically, in my third book, Queen of the Darkest Hour, the king does not want too many sons born in wedlock because each one of them expects kingdom when his father dies. Yet a queen’s responsibilities went beyond baby-making, and if the question of heirs was already settled, she could have tremendous influence. Bertha Broadfoot, 1848, by Eugène Oudiné at Luxembourg Garden, Paris (copyrighted photo by Marie-Lan Nguyen via Wikimedia Commons). This does not mean the queen is relegated to the role of housewife. In the Middle Ages, the personal and political were intertwined. The queen was the guardian of the treasury, and she controlled access to her husband. Alcuin, an influential scholar, wrote to the queen to find out where Charlemagne was spending the winter. When houseguests were foreign dignitaries, royal hospitality was key to international relations. Hospitality was more than just showing good manners. Frankish royalty would want their guests to report to their own rulers that the palace was beautiful and sturdy, the baths were hot, the table was laden, the host well dressed, and the guards and servants well cared for. All signs of power, important to project even to one’s own allies whose support could shift. Of course, this time period was hardly ideal for women. Girls as young as 12 or 13 were considered marriageable, and their families chose their husbands. Among aristocrats, marriage was most often for political reasons. Canon law gave women the right to consent to a marriage at age 15 or 16, but that could be beaten or starved out of them. However, the reason for this post is that too often women are portrayed only as victims and not as full human beings who could influence events around them and contribute to their societies. Carolingian queens certainly did both. So, let me get this straight, a group of men bent on treason and murder would release someone who overheard their plot merely because he promised not to tell? While a medieval audience might believe the conspirators would not wish to desecrate the church (and anger God) by spilling blood within it, I think even they would have a hard time believing the would-be killers would simply walk away from the clerk under those circumstances. Medieval people believed oaths, especially those sworn on a saint’s relic, were sacred, and breaking them could bring divine retribution. But they had seen people break those oaths and shift loyalties. Even the conspirators would know oaths made under duress were invalid. This is another reason Notker strikes me as the kind of guy who doesn’t let the facts get in the way of his story. In the real history, Fardulf, a Lombard deacon and scholar, revealed the plot against Charles by his eldest son. Exactly how he discovered that plot is a mystery in the reliable sources, so I borrowed a tiny bit from Notker’s account for a scene in Queen of the Darkest Hour. Just enough to be believable. One of the toughest things for me as a 21st century novelist is when my medieval heroine believes something I find repugnant. In Queen of the Darkest Hour, it was unavoidable. If we are to believe Charlemagne’s biographer Einhard, the monarch’s eldest son, Pepin, was hunchbacked. Medieval folk believed their rulers must be physically perfect, and a deformity or disability was a curse from God, angry about a parent’s sin. One early medieval mother wanted to sell her misshapen child into slavery to forget her sin of conceiving the baby on a Sunday. If my villains were the only people to hold such prejudices, writing would be so much easier. Heck, I want readers to have someone to route against as much as I need a character for them to cheer on. But my heroine, Queen Fastrada, is a medieval woman. Among the tidbits we know about the real woman, she was pious. The 787 entry in the Royal Frankish Annals has her and Charles praising God for His mercy when they are reunited in Worms after his journey to Italy. A 791 letter from Charles to her asks her to ensure that three days of litanies are carried out at home as they were in a settlement at the River Enns. The Franks literally want God on their side as they are about to go to war with the Avars. In my novel, I took liberties with the truth; this is a work of fiction after all. But Fastrada was a real person, and I feel a responsibility to stick to what’s known about her where I can. So this medieval heroine has the biases and beliefs that come with her time. 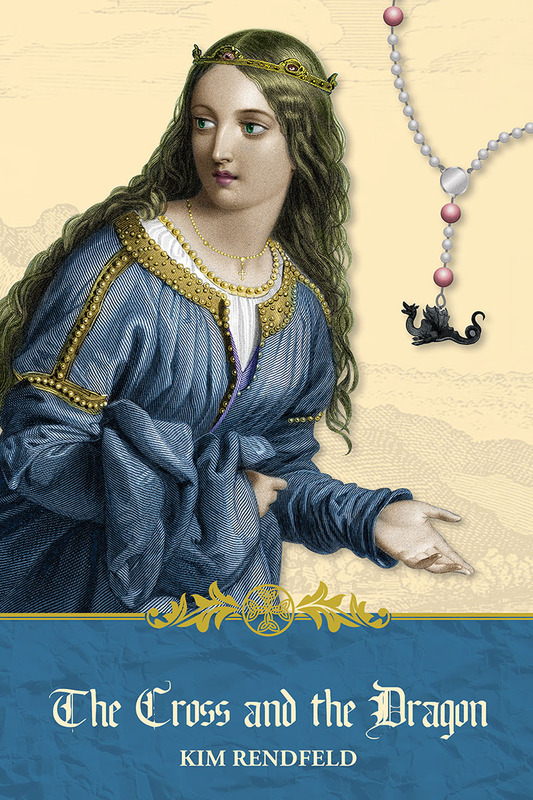 She perceives Pepin’s condition as a divine sign. Pepin himself is a product of those times too. In my version of events—we don’t have anything to reveal the real Pepin’s thoughts—he believes his deformity is God’s retribution for a parent’s sin and resents it. And that anger drives him to plot against the person he holds responsible. Was Pepin the Hunchback Really Hunchbacked? In Queen of the Darkest Hour, I needed to make a choice: should Charlemagne’s eldest son, Pepin, have a deformed spine? Pepin has been called Pepin the Hunchbacked through history—I did not make that up. We can credit (or blame) the monarch’s posthumous biographer Einhard, who described Pepin that way. He and Notker—a guy who embellished stories and made stuff up decades after the emperor’s death—are the only contemporary sources to do so. Medieval writers did not stick only to known facts. Einhard already called Pepin’s mother a concubine rather than a wife. (Readers of this blog will remember why I think Himiltrude was indeed married to Charles.) Could Pepin’s physical imperfection be an invention to further delegitimize him? Such an imperfection would be a sign of God’s displeasure and make Pepin, who later rebelled against his father, unfit to rule. Unless Pepin’s skeleton is found somewhere, the answer remains a mystery. As a novelist, I had to do what I always do: decide what works best for my story. Sort of. Pepin had stooped shoulders in my first two books, long before I knew I would make him a major character. In my version of events, he was stuck with the affliction. His having a deformed spine worked to my advantage, after all. If the real Pepin was misshapen, we don’t know what he thought or felt. That is where the novelist steps in. It is possible he, like most medieval people, believed that his condition was God’s curse for a parent’s sin. And that provides the necessary resentment for him to plot against his father.